Supernodes (aka Masternodes) are gaining traction in the blockchain space as a mean of expediting transactions. They work by constructing a second layer network around the nodes that maintain the blockchain itself, and are able to provide additional functionality on top of the blockchain such as “off-chain” transaction processing or governance. Supernodes/ Masternodes usually run on a Proof-of-Stake model requiring staking for collateralization, and provide passive income to their owners, which explains their popularity. 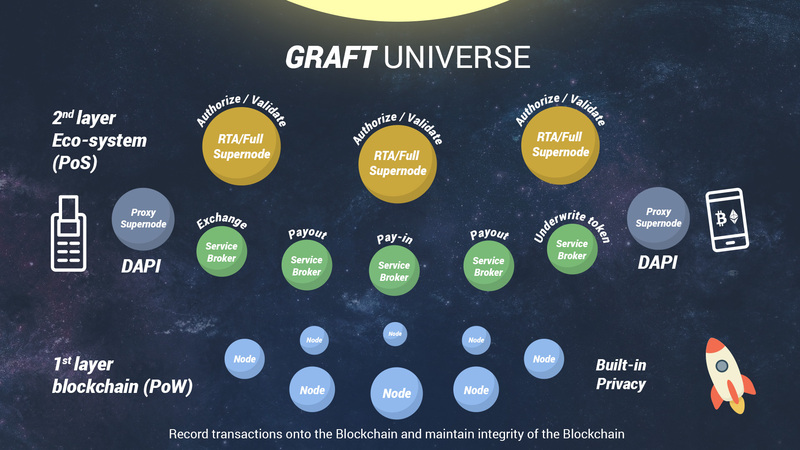 GRAFT Network was originally conceived by Slava Gomzin, author of “Hacking Point of Sale” and “Bitcoin for Nonmathematicians” – some of the seminal work in the point of sale and cryptocurrency spaces. The network is designed to address all issues that cryptocurrency faced at the point of sale – speed, fee, and privacy, while taking advantage of the “smart” nature of digital money backed by the smart contract capabilities. The project is an open platform / open source and the network is free to use with the low 0.5% network fee paying the Supernodes for their service.